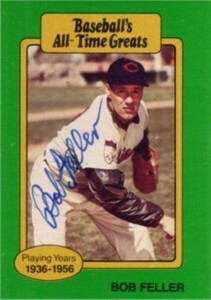 Baseball's All-Time Greats card autographed in thin blue marker by the late, legendary Hall of Fame fireballer Bob Feller. With certificate of authenticity from AutographsForSale.com. ONLY ONE AVAILABLE FOR SALE.